If visitors to the Holy Land look past the quarried stones of holy sites and shrines they can encounter members of Christian communities who have worshipped at these holy places since Christianity began. These “living stones”, as they are often called, make up the first indigenous Christian community in the world. The first followers of Jesus were Jews or Jewish proselytes — a biblical expression that included gentiles who had converted to Judaism and gentiles who were considered “resident aliens” in the land of Israel or Palestine. Although the Christian Church began as a movement within Judaism (and its first 15 bishops were of Jewish ethnicity), by the end of the first century it was becoming more gentile than Jewish. Descendants of the early Christians still live in the villages and cities of Israel, Palestine and Jordan. Among their ancestors were those who heard Jesus preach, saw him heal the sick, and perhaps were among the 5000 miraculously fed on loaves and fishes. Bible history happened in their back yard. These Christians are in Jerusalem, in Bethlehem, in Galilee and in Jordan. They tend olive trees, trade in the souks, teach in colleges, subsist in refugee camps. 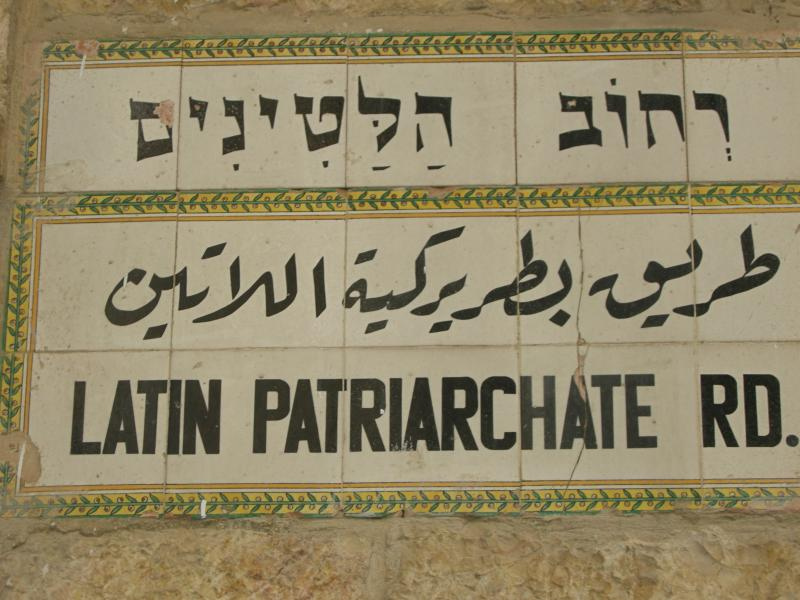 Now divided into Orthodox, Catholic and Protestant communities, their predominant language is Arabic (Acts 2:5-11 notes that Arabs were among the polyglot crowd gathered in Jerusalem at Pentecost). For pilgrims to join the often-vibrant Christian communities of the Holy Land in worship and discussion is a welcome act of solidarity and encouragement. To visit the holy places without acknowledging the Christians who have lived and worshipped there from the time of the first apostles is a disappointment to these beleaguered people. Living in a predominantly Judaeo-Muslim world, the Christians of the Holy Land continually struggle for religious identity. Economic hardship, political uncertainty, and religious and ethnic discrimination are faced daily. Yet Western Christians largely ignore these members of the “Mother Church” of Christianity, even though their numbers are declining to an alarming level — less than 2% of the population in Israel and Palestine. The struggle to lead a normal life has caused thousands of Christians to emigrate, especially from Palestine. More than half of all Christian Palestinians now live outside the Holy Land. 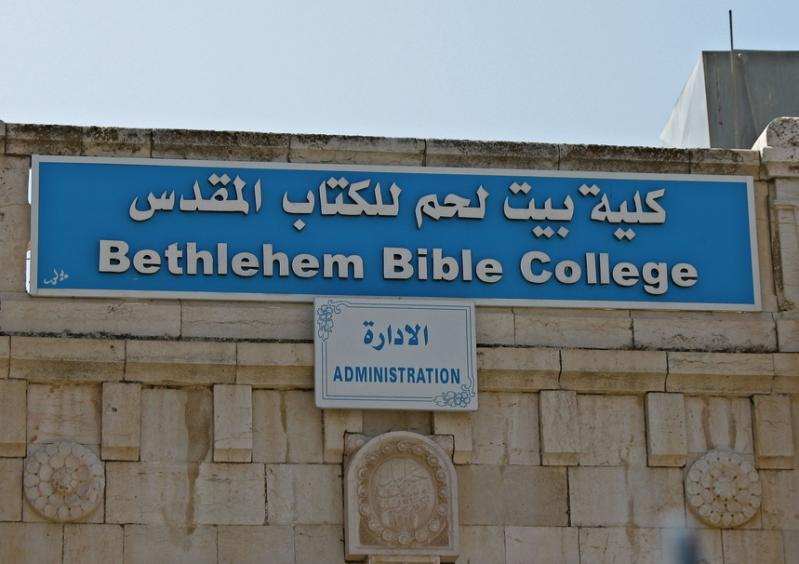 The West Bank city of Bethlehem, once a Christian town, is now mostly Muslim. There are more Christians from Bethlehem living in Santiago, Chile, than in their home town where Christ was born. In 2014, Israel had just over 8 million people, the Palestinian Territories 4.5 million and Jordan 6.5 million. Christians were estimated to make up between 2 and 3 per cent of these totals (over 2 per cent in Israel and Jordan and about 1.25 per cent in Palestine). The proportions in Israel and the Palestinian Territories had declined from about 10 per cent before 1948. • About 160,000 Christian migrant workers (primarily from Asia), asylum seekers (primarily from Africa) and overstayers (mainly from Eastern Europe). In the Palestinian Territories (and East Jerusalem) there were about 50,000 Christians, almost all of them Palestinian Arabs. 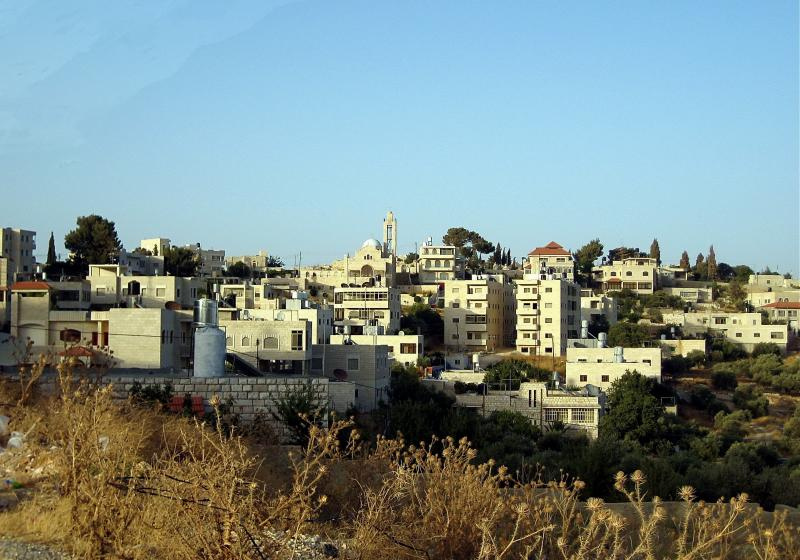 One village in the West Bank, Taybeh, was entirely inhabited by Christians. An estimated 650,000 Christians of Palestinian origin lived overseas, mostly in the Americas and Western Europe. In Jordan there were about 250,000 Christian citizens who were Jordanian and Palestinian Arabs. 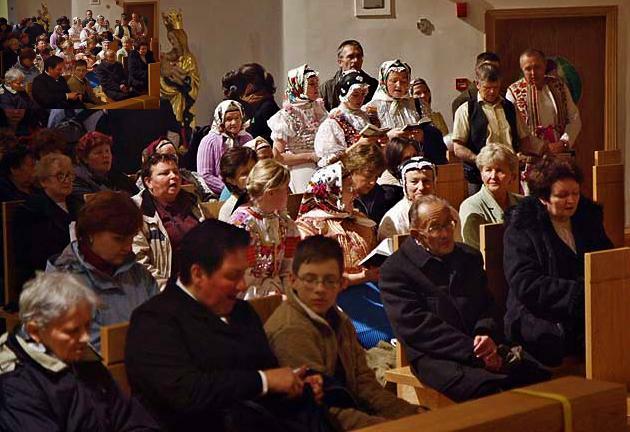 In addition there were tens of thousands of Christian migrant workers from Asia and Africa, and thousands of Christians among the refugees from Syria and Iraq. The Jordanian villages of Semakìeh, Fuhèis and Shàtana were predominantly Christian. Christians in Egypt numbered more than 12 million in early 2010, making up about 15% of the population. Coptic Orthodox predominated, but there were also big communities of Coptic Catholic and Protestants. 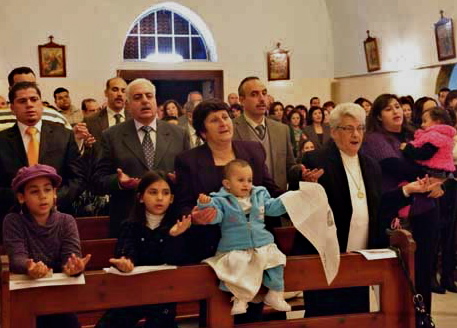 Christians in Syria numbered around 1.5 million, making up about 8% of the population. Orthodox (Greek, Syriac, Armenian) predominated, then Eastern Catholics and a smaller number of Latin Catholics and Protestants. 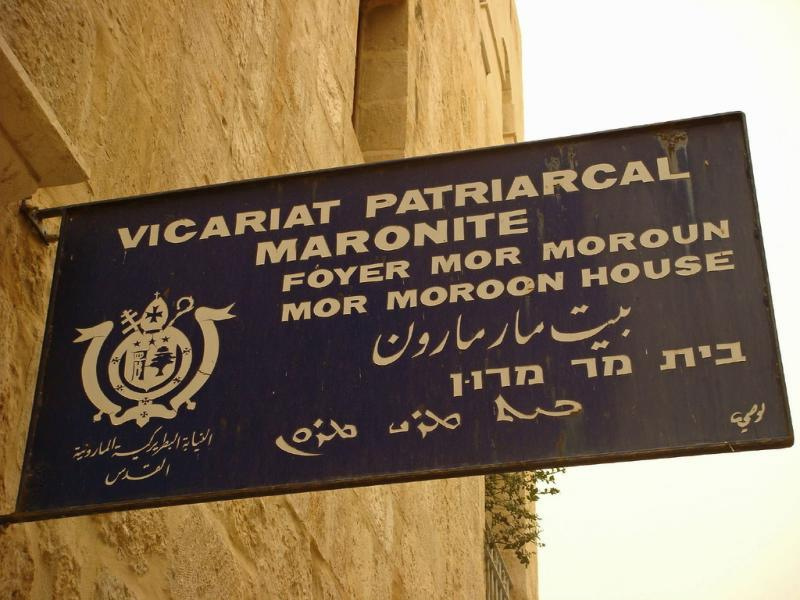 In the mosaic of Christian communities in the Holy Land, the Byzantine (or Greek) Orthodox and Byzantine Catholic churches make up the vast majority. 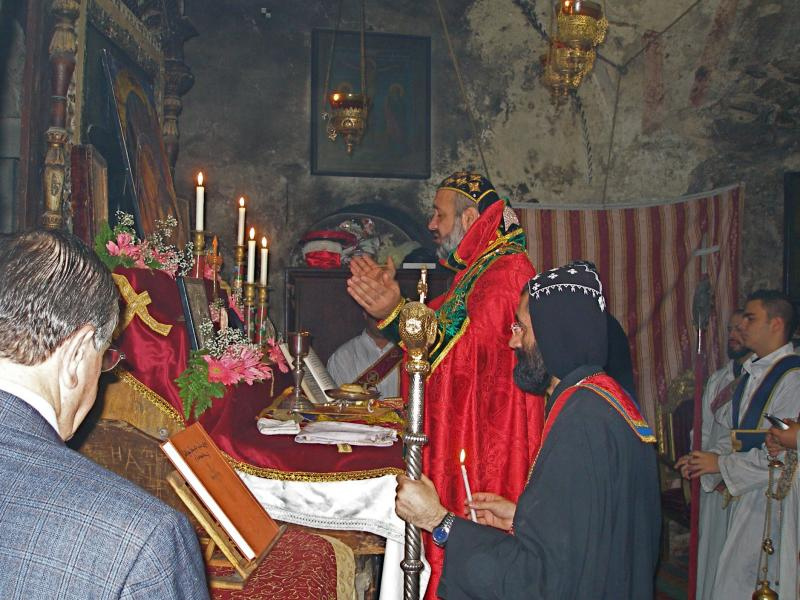 Thirteen traditional churches are recognised by the civil authorities: Greek Orthodox, Latin (or Roman) Catholic, Armenian Orthodox, Greek (or Melkite) Catholic, Maronite Catholic, Syriac Orthodox, Syriac Catholic, Coptic Orthodox, Ethiopian Orthodox, Armenian Catholic, Chaldean, Anglican and Lutheran. There are also many Protestant and Evangelical churches. 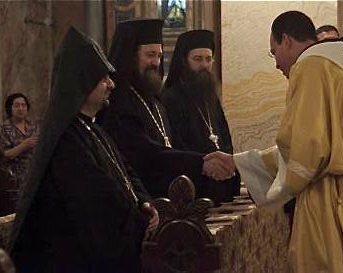 The Christian churches of the Holy Land constitute a rich diversity of languages, liturgies, national identities and clerical dress. God is worshipped here — where Christian worship first developed — in ways that may disconcert Western pilgrims. Interiors of church buildings are often covered with frescos and other paintings. 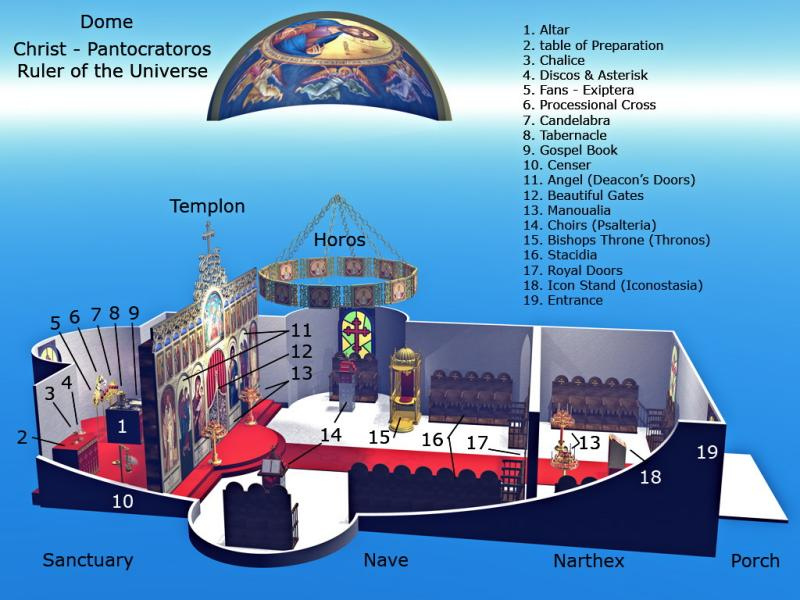 The sanctuary around the altar is usually set apart by a screen decorated with icons (the iconostasis). Votive lamps hang in profusion. Worship services tend to be more elaborate and prolonged than in the West, with bells, candles, incense and chanting. Singing is usually unaccompanied by musical instruments, since it is considered that only the human voice — made by God — can worthily praise him. Worshippers express their personal piety by moving around to light candles, kiss icons and make their own prayers. People come and go freely during a service. 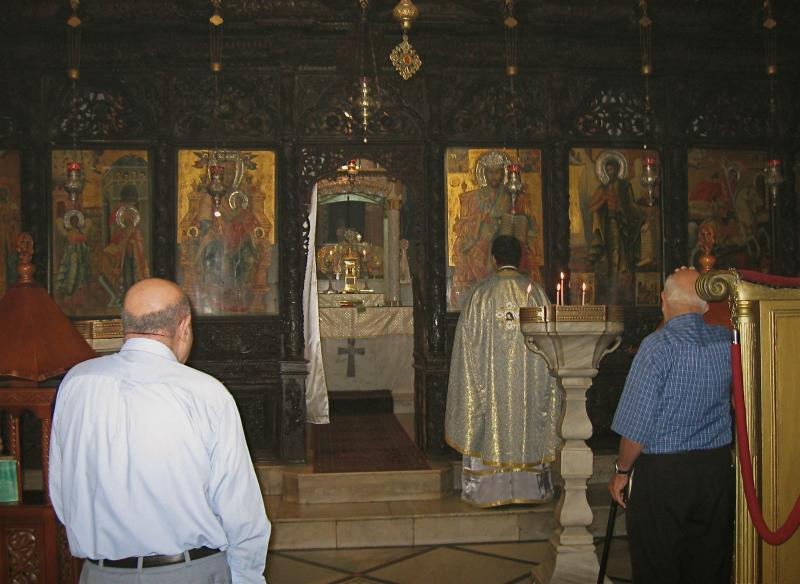 How can Western pilgrims encounter local Christians in the Holy Land? There are many possibilities, and travel agents can often make the contacts. 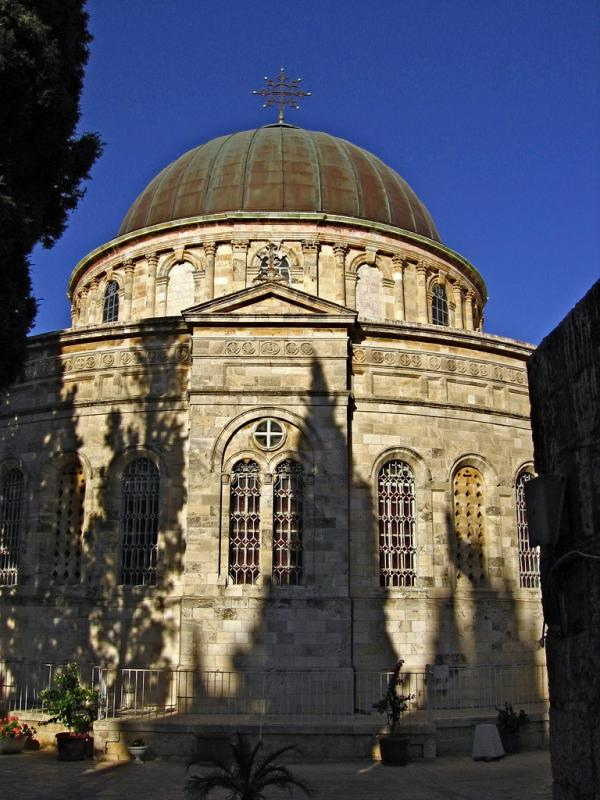 • Before leaving home, read about the situation of the Holy Land’s Christians. 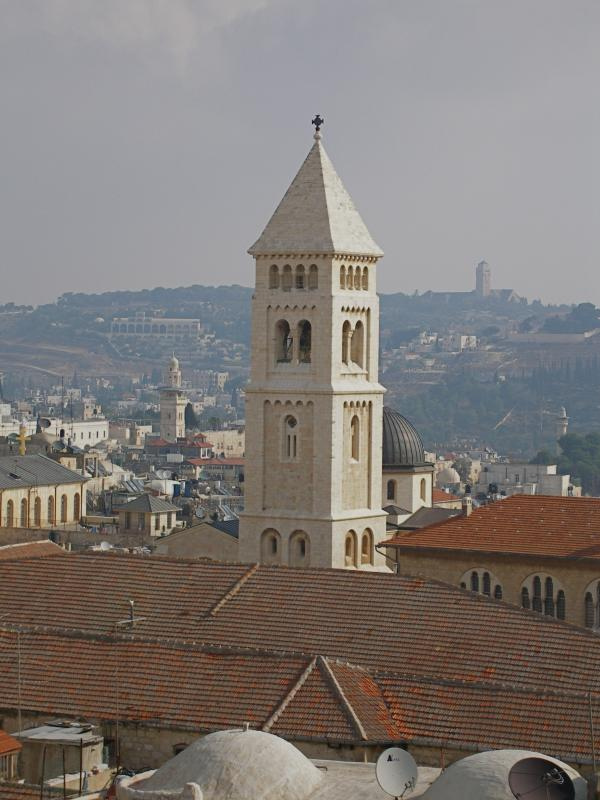 • Request a Christian guide for your group (many Christian Palestinians depend on tourism for their livelihood). • Worship with a Christian congregation and, if possible, stay and talk to its members afterwards. • Ask for a meeting with a local church leader, or a speaker from a local church. • Visit a church-sponsored educational, medical or social service institution, or a development project of a charity you support. • Arrange to meet foreign Christians working with a church or other non-governmental organisation. • Ask for a visit to a refugee camp, human rights centre, legal aid centre or peace organisation. • Make your purchases in shops run by churches or which sell goods produced for development projects or co-operatives. • Stay at Christian hospices or hostels where possible. • Talk about the situation of Christians in the Holy Land when you return home. Finally, your travel agent or an interfaith group can arrange meetings with representatives of the other two living religions of the Holy Land, Judaism and Islam, who are working for peace, justice and reconciliation. PHOTO CREDITS: Where the images above are not created by Seetheholyland.net, links to the sources can be found on our Attributions Page.